Animal behaviour vs conservation – a house divided? Once a year, I have a crisis of confidence about my academic choices which coincides with the annual Student Conference on Conservation Science. For three days Cambridge’s Zoology Department becomes a cosmopolitan conservation hub as students from across the globe gather to present their work to their peers, the next generation of environmentalists. Each year I lend a helping hand serving tea or manning the registration desk, and so far every year I’ve been the token animal behaviourist. “What do you work on?” people ask. Do they sense an imposter? I don’t make the IUCN list, and they know it. I cut my losses. But, it’s not true! Much as I love free tea, it’s inspiring, refreshing, and galvanizing to hear of excellent research going on in the field of conservation, and it reminds me each year that [*cheese disclaimer*] I also want to make a difference. But I can’t, because I followed my curiosity not my conscience, and here I am in behavioural ecology. Right? We summarize 18 common misgivings that animal behaviourists raise about becoming involved in conservation. We argue that many of the supposed institutional and interdisciplinary differences break down under scrutiny; that the supposed basic-applied dichotomy is often imaginary or insufficient to prevent interchange of ideas between behaviour and conservation; and that arguments about professional lifestyle, scientific inflexibility and despair are not adequate justifications for remaining on the sidelines. We suggest that many studies of animal behaviour are relevant to solving conservation problems, and we therefore encourage behaviourists to contribute more strongly to finding practical solutions to the contemporary conservation crisis. Caro practises what he preaches. One of the world’s most prominent mammalogists, he heads an impressive research group at UC Davis in California, with ongoing work on a diverse range of subjects – from conservation and development in Tanzania, to the evolution of zebra stripes. Paul Sherman of Cornell University works on social and reproductive behaviour. Together they have produced papers on how environmental change and the increase in endangered species threatens the very field of behavioural ecology (1,2). Although this view has not been universally accepted it seems that they have been successful in opening the debate – why, on the whole, are behavioural scientists avoiding involvement in conservation? This paper gives eighteen “common misgivings” that behavioural scientists raise about involvement in conservation science – from the practical (“There is no targeted funding for studies in animal behaviour or behavioural ecology that apply to conservation issues’) to the downright silly (“I’m too busy / It’s depressing / I don’t have the necessary people skills”). Do people really say those things?? Ok, so a paper containing the phrases “This is a cop out. It is never too late to change… Stop wallowing in self-pity and get more involved!” (quote) may seem more akin to a motivational self-help guide, but Caro and Sherman do make some cogent points. First, the issue of funding is of course of major importance. Caro and Sherman argue that embracing conservation issues as part of animal behaviour projects could in fact “expand funding horizons”, especially if your study species, for example, provides ecosystem services (pollinators etc.) or is a bioindicator of pollution, temperature change, and so on. I think to an extent this is true: even at my level it is common knowledge that just by saying something fuzzy like the findings of your work may have implications for conservation/biodiversity/pandas will help you get your proposal consideration and attention, but hitting the buzzwords doesn’t necessarily signify real crossover between the disciplines. Funding aside, the expectation of failure to actually have any tangible impact is a theme that Caro and Sherman draw on heavily, suggesting that academics feel peripheral in conservation, which is under the domain of state agencies and NGOs, while professional conservation managers deal with practicality, not p values. This, they say, is no longer exclusively the case. Thanks to increased awareness of a need for sustainability, there is now appreciation among hunters and fishermen for understanding of reproduction, dispersal and responses to environmental perturbation. Academics are also increasingly being drawn into policy making. A particularly topical example given is the targeted study (see Donnelly et al. 2006) of the effects of badger culling on the spread of bovine tuberculosis in the UK used to advise governmental bodies. Despite studies showing that culling does not, however, decrease TB spread overall, culls are still planned for this summer. Not, then, the most encouraging example of scientific study impacting decisions made by governing bodies. Other reasons put forward for why some animal biologists remain on the sidelines are not convincing. I find it hard to believe that anyone in behavioural ecology would believe that their study species could not qualify for conservation interest just because they are not charismatic megafauna. Likewise that they would not think that their work on individual variation could be extrapolated to population or meta-population level, the resolution of most use to conservationists. If these are genuine misgivings that Caro and Sherman have actually come across, I could possibly start to understand their tendency to sound like desperate football coaches giving a pep talk at half time. I have to admit that I find it hard to disagree with this. As much as I see the importance of conservation science, I find animal behaviour more interesting – it’s why I’m doing what I’m doing. I believe, however, that there may be truth in the old saying, horses for courses. Couldn’t we have it both ways? Couldn’t a study on whether habitat quality influences meerkat dispersal patterns equally be a study on how anthropogenic farmland degradation affects populations of local wildlife? I know which I’d rather read – but it seems to me that behaviour and conservation need not be mutually exclusive. An appropriate post to mark the end of pancake-gorge-fest and the start of Lent? Perhaps not: in this case, the sexiness of male hihi (Notiomystis concta) has everything to do with what they ate – but as nestlings, not adults! Cambridge PhD student Leila Walker, in collaboration with Dr Becky Kilner and Dr John Ewen at ZSL, hand-fed hihi chicks a normal diet, or one supplemented with carotenoids, pigments found in plant cells which occur naturally in the hihi diet of nectar, fruit and invertebrates. Boosting intake of carotenoids in nestlings resulted in brighter plumage as adults, and, as in many bird species, fancy feathers leads to greater mating success. And, unfortunately for the hihi, mating success is just what this bird needs. They are listed as vulnerable by the IUCN and occur naturally in only one small island population in New Zealand. 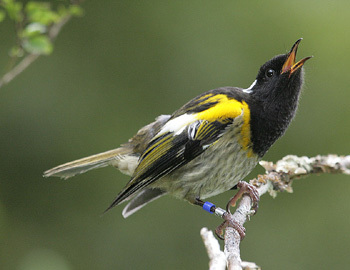 A team of hihi researchers is leading a concerted conservation effort, including reintroducing populations to the mainland to boost numbers, and supplementing the diet of wild hihi. That’s where Leila’s work comes in. Here’s a great example of where behavioural ecologists and conservationists could join forces. By conducting studies in this way of what diet will produce the best offspring and guarantee high mating success, behavioural scientists could help to restore the numbers of this lovely little bird.